...in the Magic Kingdom! 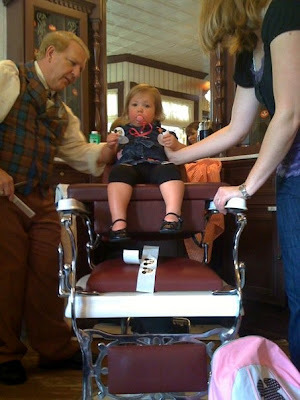 There is a old-fashioned barber shop right on Main Street where anyone can get their hair cut. They have a fun first haircut package that also includes baby Mickey ears that say "First Haircut," a certificate, and a lock of hair. Here is a picture from Chet's phone... Hannah wouldn't let go of me long enough to take any pictures. She was not thrilled to be up there! Even the 20 Mickey stickers wasn't enough to entice! Of course, life is much better after a ride on "it's a small world" (in the background) and French fries and ketchup! What a great weekend! Saturday, we met my cousins at the Grapevine Botanical Gardens. We haven't ever been over there before. It is such a pretty area. Hannah loved being able to explore and it was a beautiful fall day to do so! She found these pumpkins and kept trying to pick them up, but they were "stuck"! Sunday night, we headed over to Legacy for Trunk or Treat. We had a great time there with grandparents, aunts, uncles, and cousins! Hannah didn't walk around Trick-or-Treating; she much preferred to eat goldfish the entire time with Mamaw. Hannah shows Aunt Jamie her "princess" shoes. We head to Disney World in just a couple of days for a business meeting with our agency and then a week of fun! Saturday, we will be trick-or-treating in the Magic Kingdom! Happy Halloween!